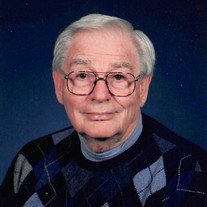 Edwin Rufus Putman, age 90, of Lebanon, OH, died Wednesday March 20, 2019 at Otterbein Of Lebanon. He was born in Cincinnati, Ohio on January 31, 1929 to Edwin and Adaline (Dressel) Putman. Ed served in the Army during the Korean War. He was a faithful employee with Anderson Funeral Home in Cincinnati for 50 years. He was preceded in death by his parents and daughter, Melissa McClanahan. Ed is survived by his loving wife of 67 years, Janet Howison Putman, a son, Mark (Marge) Putman; son in law Don (Darlene) McClanahan, grandchildren, Sarah Putman, Alison (Liam) Gambill, Abigail Martin, and Andrew (Abbie) McClanahan and Mary Katherine McClanahan; also great grandchildren, Logan, Greyson, Charlotte, Aston and Odin. Memorial Services are 4:00 pm Saturday, March 30th at the Otterbein Chapel with George Phillips officiating. Visitation will begin at 3:00 pm until time of service.